At LCP, we believe that children learn best in a playful joyful environment having a wide variety of opportunities for hands on, concrete learning and engagement with materials that are personally meaningful to the children. We teacher’s experience and knowledge of development guides curriculum, and the curriculum is different from year to year, reflecting the diversity of interests, learning styles, strengths and challenges of the particular children in the group. We seek to prepare a rich and stimulating environment with many possibilities and open-ended materials. We then observe and listen carefully to the children, and make classroom decisions in partnership with the children. Teachers are also partners in learning with the children, and model the curiosity, research and documentation skills, ability to ask questions, and engagement over time, that are features of deep learning. 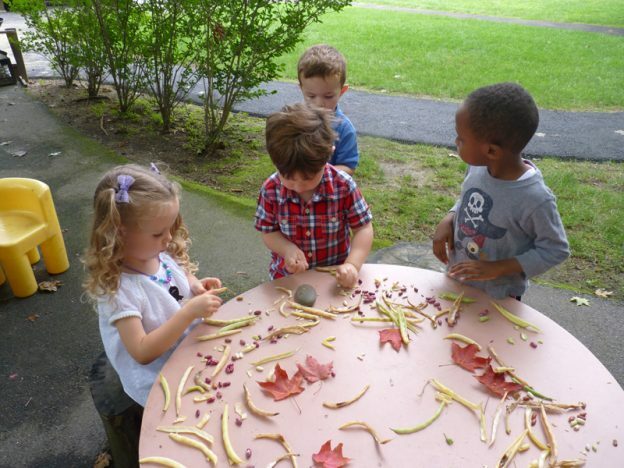 Diverse experiences, learning styles, and interests are all valued as children and teachers cooperate together to create a “community of learners”. Documentation of children’s work, of plants or other elements from nature, of classroom collections are at both child and adult level whenever possible. Why do we document? As children and teachers get to know each other, ideas for curriculum unfold and develop. Curriculum includes everything that happens in our program – from finding a cubby for the first time, exploring a new space, getting to know new people, learning a new skill, to investigating a theme or project together. Documentation gives us a way to organize our thinking about what happens, gives us something to show the children to trigger memories and conversation about our time together, and gives us a way to share experiences with parents, who are looking for a “window” into their child’s experience and are often looking for ways to deepen their understanding of learning and teaching in early childhood. We keep this documentation available over extended periods of time, so that children can share memories of common experiences, deepen their understandings, share perspectives, and re-visit experiences. There are unlimited paths that can be taken to develop skills. It’s important that we join children “where they are” to establish trust, and to assure that children know they will be listened to and appreciated for their unique qualities and contributions, and so that we can encourage each child as they “learn how to learn”. Projects can provide a structure through which children can share perspectives on a common theme and learn together. Projects include opportunities to discuss, revisit ideas or common experiences, research an area of interest, develop skills, develop theories or solve an intellectual problem. They can last a day or several months, and may involve the whole class or a small group of children who share a common interest. 1. First, there is discussion. Children talk about what they already know, what they are interested in, and may identify questions they would like to answer about the topic. 2. The second phase of the project may include activities, opportunities to research the topic, opportunities to talk with “experts” or participate in presentations about the topic. 3. Projects typically end with a culminating event or product that brings closure to the shared experience. This could be a presentation for family, making a book or participating in a performance, or deciding how to share information about the project to another class or to other teachers. Children typically help decide the best way to represent their new knowledge about the topic, and participate in evaluating the experience as well as their participation. What would we like to find out? How will we find out? How will we document or show what we are learning? How can we share our new knowledge and our work with others? How did it go? How do we feel about our work? What projects will develop in our classrooms this year? We are in our first few weeks of school but already have beginnings. As children investigated our playground gardens his fall, they discovered the wide variety of seeds and are beginning to think more about how plants change and grow. We found seeds together outdoors, planted seeds indoors to watch for changes, look for seeds as we cook with vegetables through our early sprouts curriculum, and recently opened a pumpkin to see and feel what’s inside. Teachers imagine that this beginning may develop into an on-going investigation of seasonal changes on the playground. Many children expressed a strong interest in volcanoes in the nuthatch class and teachers followed their lead, offering opportunities for children to draw what they know, research books and photos, and opportunities to create three dimensional volcanoes. After reading a classroom book called An Ocean of Animals children directly asked for more time to talk about “the deep deep ocean”. Teachers asked children to describe more about what they were interested in, and created a board with their questions. Then teachers asked “what would we do?” Children asked to draw, paint, create ocean scenes representing the variety of zones they are interested in, and make a variety of animals out of clay. The documentation of this planning process is posted in the classroom so that children can continue to express their interests as we begin. Children asked the question, “Where does water come from?” on a rainy day. This led to beginning discussions of water and rain. After drawing their theories, teachers introduced a book called All the Water in the World. In another discussion, one child asked about the word absorption and children shared their ideas. Follow up investigations have been on-going in the water table, where a variety of materials have been available to explore absorption. Children also used liquid watercolors on paper towels as an extension of this investigation. Conversations about water then led some children to questions about sinking and floating, an investigation at the water table currently in process. This entry was posted in Curriculum, Education, Philosophy, Play, Project and tagged children, curriculum, education, learning, preschool, project, science on October 7, 2018 by Katrina Selawsky.